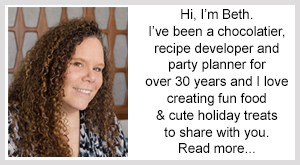 May 8, 2015 By This post may contain affiliate links. 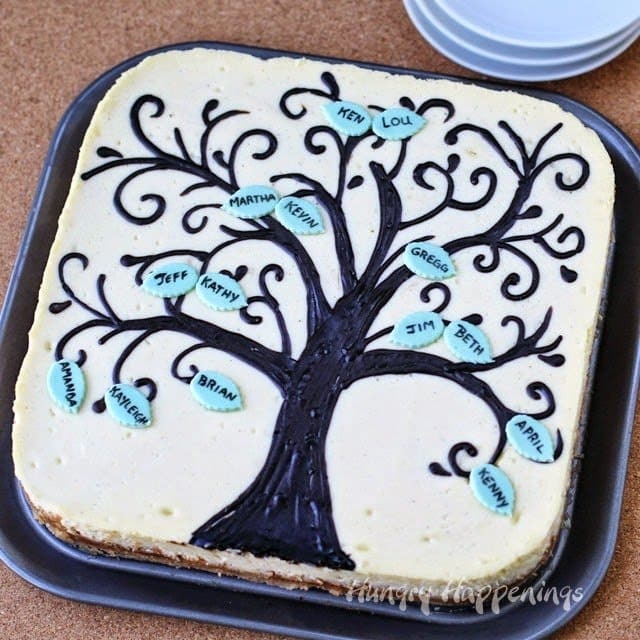 Create your own Family Tree Cheesecake! 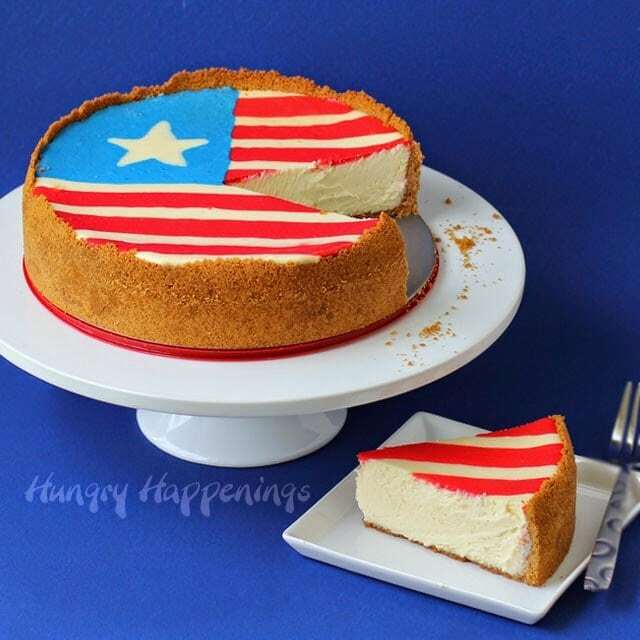 This is the perfect dessert to impress the women in your family on Mothers Day and show them how important family really is! 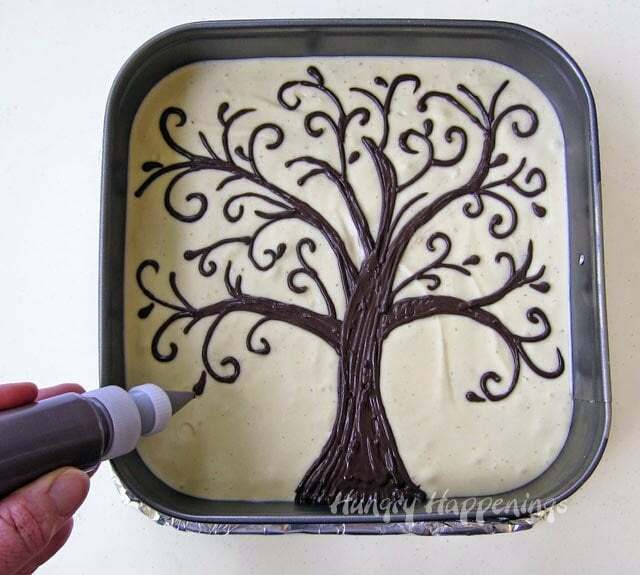 If you can draw a simple tree, you can decorate this festive cheesecake. This cheesecake topped with a personalized family tree will make a wonderful dessert to serve on Mother’s Day, Father’s Day or even grandparents day. 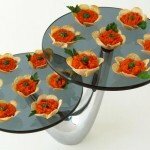 It would also be a fun treat to give to a new mother after the birth of her child. With Mother’s Day fast approaching, I began to think about all the branches on our small family tree.I always imagined I’d add a few leaves to those branches, but that didn’t happen. 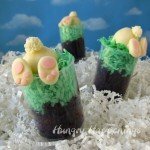 Mother’s Day is a bittersweet holiday for me. I love my mom and celebrate all that she is, but this holiday reminds me of what I missed out in life by not having children of my own. Dwelling on that doesn’t change things, so instead, at this time of year, I focus on the special relationship I have with my mother. I am so lucky to have her in my life. 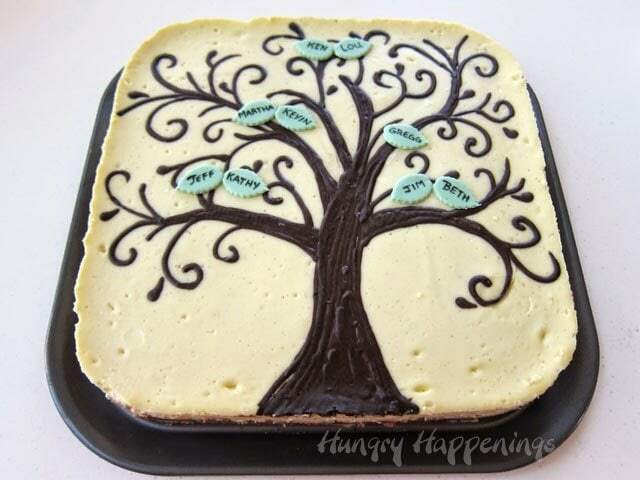 The family tree design I chose for my cheesecake is whimsical, just like my mom. Your tree doesn’t have to look exactly like mine. Just connect with your inner child and draw whatever speaks to you. 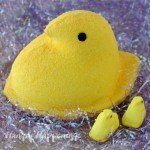 A big green puff on top of a trunk would look great filled with apple shaped name plates. So would a simple line drawing of a tree filled with red, yellow and orange leaf name plates. There are so many possibilities. Just have fun. Beat 3 blocks of cream cheese on medium speed until smooth, scraping down the sides of the bowl and the beater as needed. 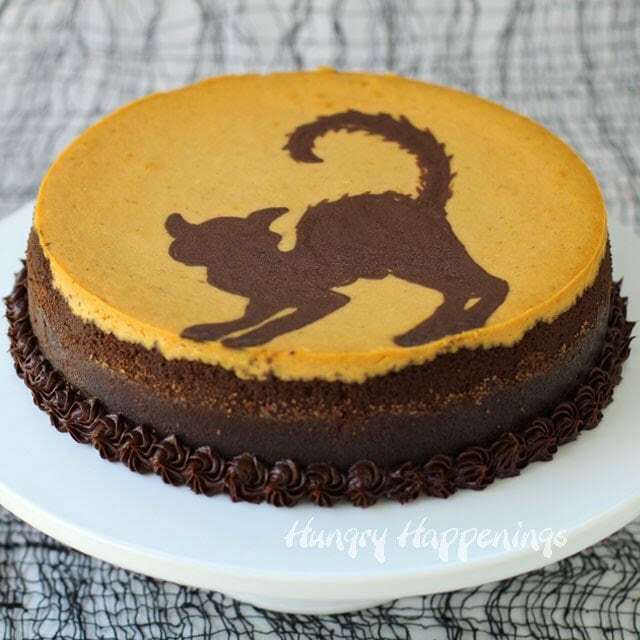 You really need to make sure there are no lumps in the cheesecake and now is the time to get rid of them. 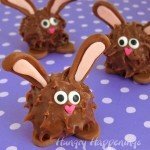 Scoop a 1/4 cup of the filling into a small bowl and stir in the cocoa powder. 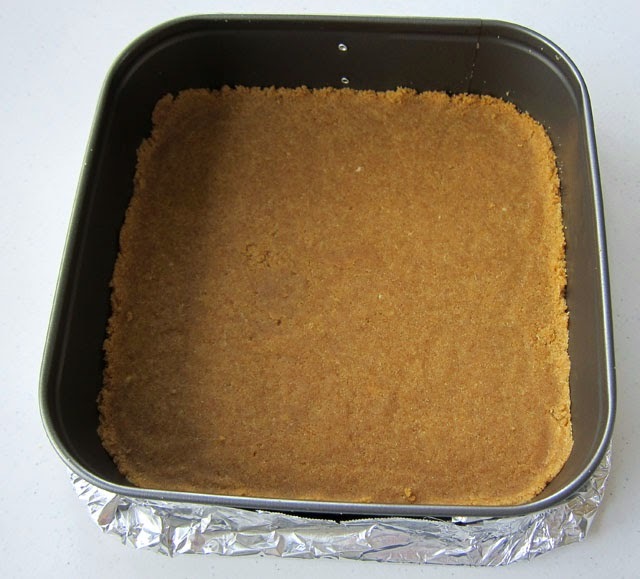 Spoon the rest of the filling over the graham cracker crust. Smooth it out into an even layer. 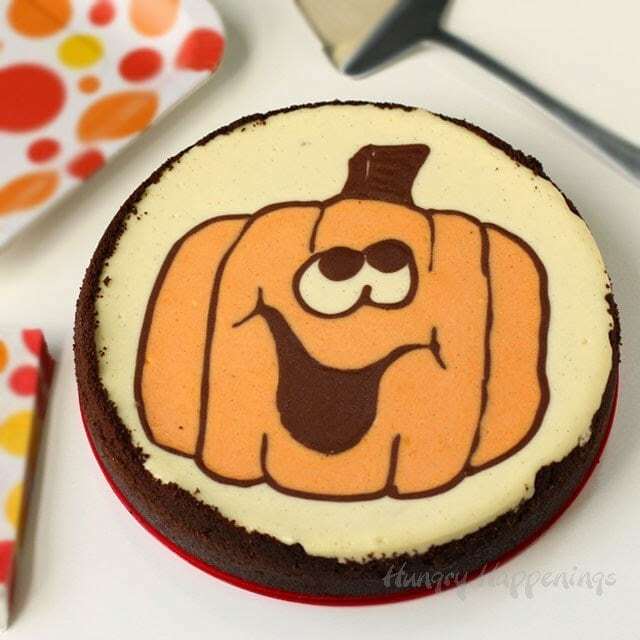 Pour the cocoa colored filling into a squeeze bottle or piping bag fitted with a small #2 round tip. 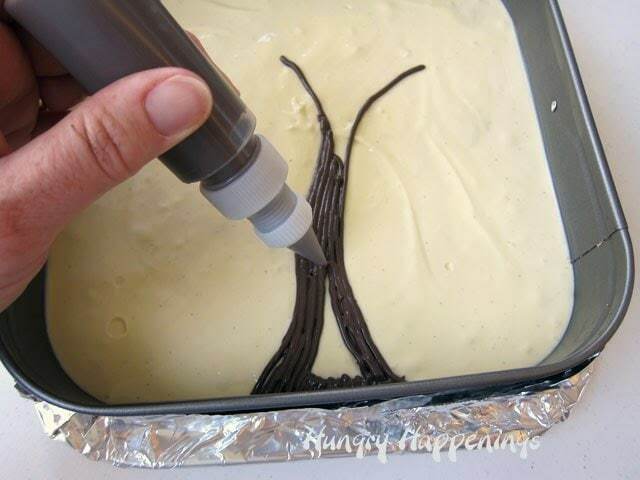 Begin by piping the tree trunk onto the cheesecake filling. Add branches to the tree adding spirals at the tips, if you like. And a few leaves, if desired. 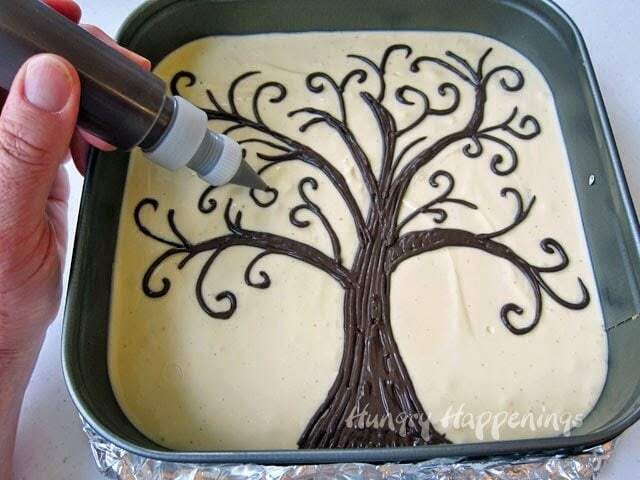 If making a multi colored tree, you can use food coloring to add color. 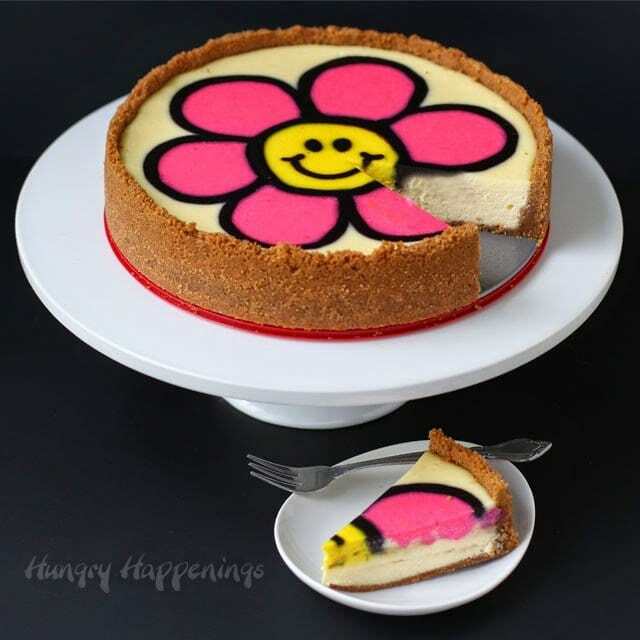 See my tutorial for the Decorated Daisy Cheesecake for detailed instructions. 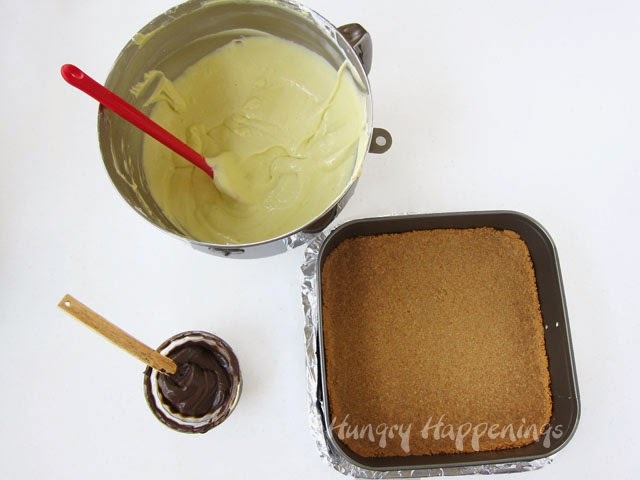 Bake your cheesecake in a water bath for 35-40 minutes. The top will still jiggle, but look shiny and set. 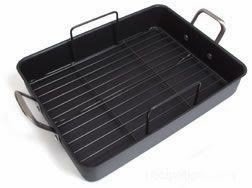 Refrigerate for at least 4 hours and up to 4 days. 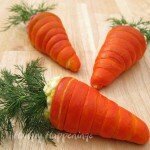 To keep longer, you may cover and freeze for up to a month. 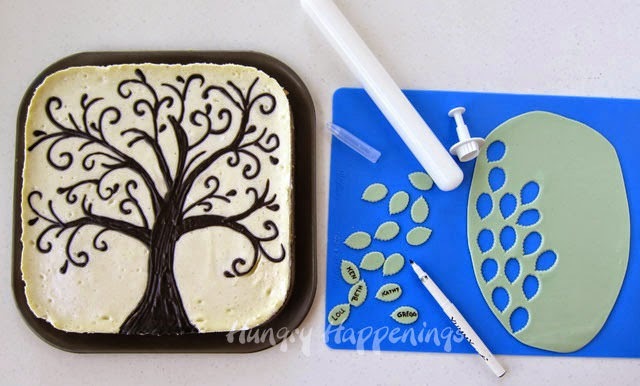 To make your name plates, roll out the green fondant and cut out leaves using a leaf plunger cutter or cookie cutter. Use a food coloring marker to write the names of your family members. 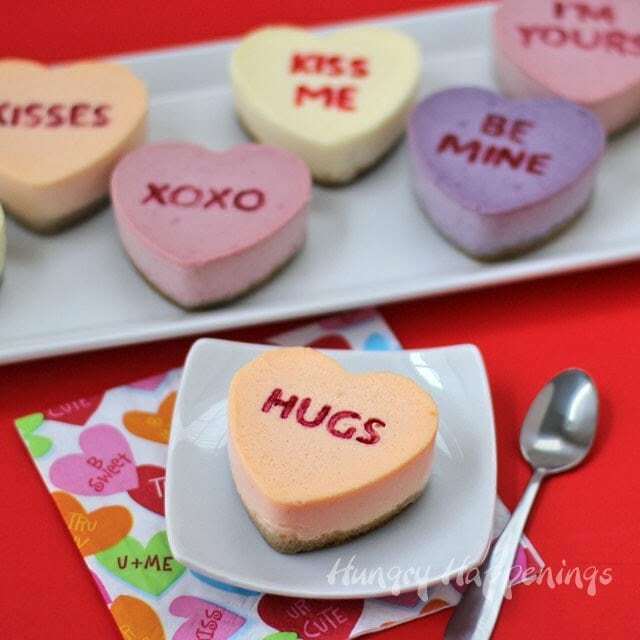 The fondant will get a bit sticky if refrigerated, so I suggest you add these name plates just before serving. 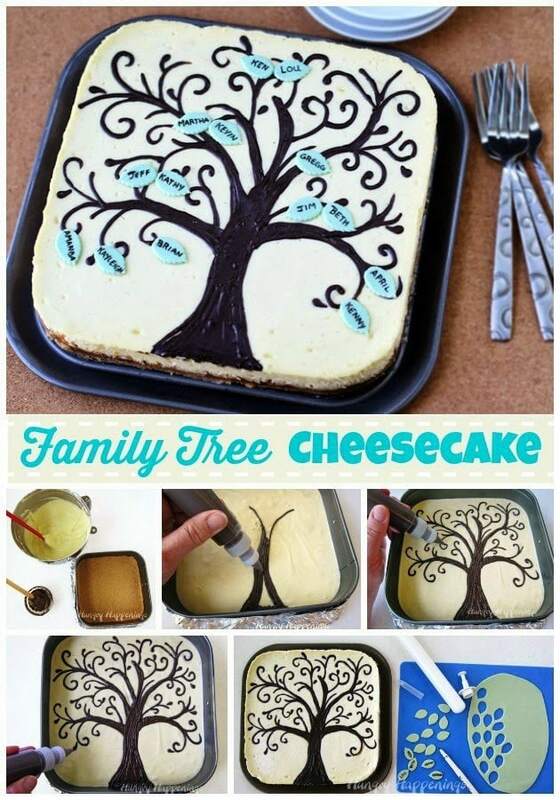 Have fun making your own Family Tree Cheesecake. 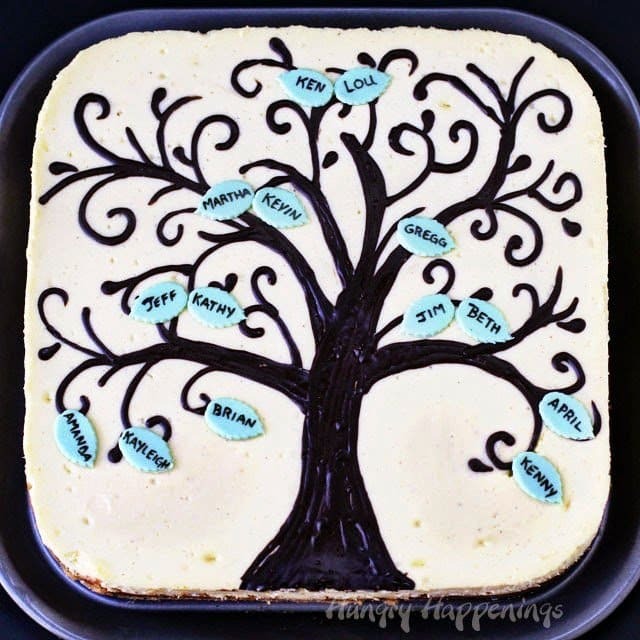 I love your family tree cheesecake..and then I read the rest of your post. Hugs to you Beth.. I prayed a special prayer for you. My baby sister has struggled for years to have a child of her own. It's something she and her best friend have in common. 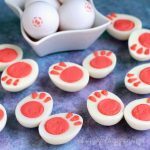 After following your blog for several years now, it seems you really have been blessed with a gem for a Mom. I know she must have loved your family tree creation. Thanks, Karen. That is so sweet! I am very lucky to have such a wonderful mom and we had a lovely Mother's Day together. She even brought me flowers and a card, which was so nice.